Home » What's New » Is Ordering Contact Lenses Online A good Idea? We have all seen the ads “Order Lenses Online and Get A Discount”, “Free Shipping to Your Door”, “A fraction of the cost”, and many more similar teasers. Are you wondering if you should give it a try? Instead of going to your local eye doctors at Peninsula Vision, maybe you should try ordering contact lenses online? Like everything on the internet, you have to take what you read with a grain of salt. If a deal sounds too good to be true, it probably is. Before you enter your credit card information, your address and medical information you need to be sure that the site you are using is reputable. Take precautions as you would with any site you are giving personal details to. Do they have a secure server? Does the company have an address and phone number? Where are they located? What is the customer service like? Can you reach them by phone? Can you find good reviews about them online? It is often best to stick with well known, reputable sites instead of going for a cheaper small site. 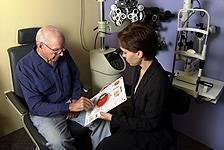 Of course, it is even safer to give your information to a real live optometrist who has an office right here in Niagara Falls and staff to help you, if needed. Many of the price comparison sites pull information from different websites and give you the cheapest option. However, these sites often don’t calculate rebates or bulk orders so the information you get may not be accurate. Shipping costs also vary greatly between sites. In order to get the best price you would actually have to go to each site, fill out your information and get to the part where you pay in order to see the final price. If you do this for a few sites, you are not saving any time ordering online. 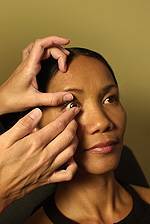 Optometrists also receive discounts and rebates from their suppliers. Since they order so many contact lenses, the companies pass savings onto them and they pass them onto you. This often results in you getting a great price on lenses from your neighborhood optometrist. Your eye doctor wants you to leave his office satisfied and happy. They will take the time, during your contact lens fitting, to discuss all the available lens types and help you decide which kind is best for your lifestyle. Do you need gas permeable lenses? Toric? Disposable? Bifocal? And which brand would suit you best? These are questions that can only be answered by a professional who takes the time to learn what your daily routine is like. An internet site cannot tell you which brand of lenses fits your unique needs. Your eye doctor can explain the different contact lens brands and may even be able to provide a trial lens, depending on your prescription. Your optometrist can order your lenses and have them ready for pick-up within a few days. Some of the online vendors may not have your prescription in stock. Your item could stay on back order for months. If ordering from the USA, by law, your prescription needs to be verified with the eye doctor who wrote it. But did you know that your optometrist only has eight hours to respond? After that, the company is allowed to assume the prescription they have (or think they have) is valid and can ship your lenses. In reality, this means that even the most consciences eye doctor may not have time to respond before the lenses go out. If the contacts are processed in the evening or times when your eye doctor is not in the office, they may not even see the request until it is too late. Before you order, check your insurance plan. It is common for vision plans to give you a percentage back just for ordering your contacts from a real brick and mortar business. There are also many plans that provide an annual amount of money for your lenses and eye exam. Check to see what your plan provides and calculate the value of using the vision plan money. Click here to see a list of some of the Vision Plans we accept in Niagara Falls. One of the most compelling reasons to order contact lenses from your eye doctor is that stand behind their products and services. If your optometrist fit you for lenses and then ordered them for you and you have a problem with them, you will often be able to exchange them. This peace of mind and reliability cannot be found at most online contact lens stores. Remember, this little item is going to sit in your EYE for a large part of the day. You need to be sure it fits well, is safe and will keep your eyes seeing their best for a long time. Are the few cents you might save worth the risks? If you have any questions, or would like to set up a contact lens exam, contact our Eye Care center.